Man, Que BILLAH is a hilarious dude. 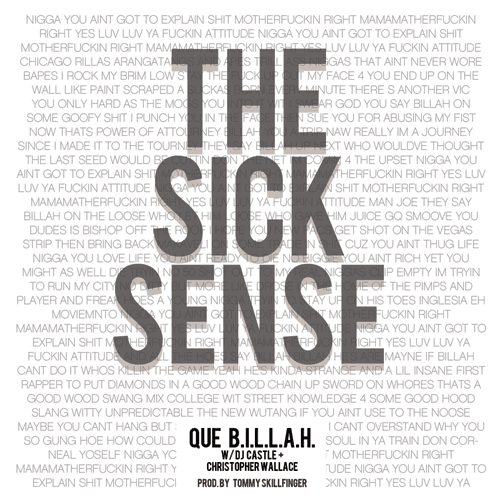 Apparently he’s resurrected the Notorious one for his new track, “The Sick Sense.” Que also tells me the video for “The Sick Sense” (directed by Noyz) will rival the 2Pac hologram. One can only imagine what he has in store for this one. Biggie back? We’ll soon see. He’s sick for this one. Inspired by the late great Notorious B.I.G. Que Billah has enlisted Dj Castle to perform a hip-hop seance and channel Christopher Wallace who agreed to feature on the hook. And for those of you that don’t believe in Ghost stay tuned for the video, dropping in a few weeks. Maaan Joe…….This is it right here Que! Que killing it again!…the hook, the beats, the lyrics, the flow..this is dope…he’s definitely there….